In today’s day and age, meeting someone on social media or a dating application is completely normal. In fact, it’s probably the #1 most common way to meet your next significant other. Meeting someone while you’re out and about is not typical these days, but it is still possible. And, if you’re that person that wants to meet your next girlfriend ‘organically,’ you’re probably already wondering what the best location is to do so. Okay, let me stop you in your tracts before you start thinking too hard. 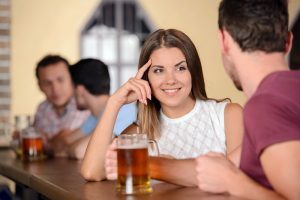 The best place to meet someone the natural way is in a bar; Bars are casual, the drinks make conversation flow easier, and the atmosphere releases all the awkward first impressions. With all of that being said, I’d like to be the first to state something: Men can be really creepy when buying a woman a drink in a bar. I’m totally serious. I know it’s unfortunate, but it is the truth. I’ve been approached time and time again at a bar. Guys always seem to do it the wrong way. I’ve had people bring drinks over to me and think that what they’re doing is completely generous. I’ve had men suggest that I owe them something after them buying me a drink (hello, I didn’t ask for the drink, why do I owe you something?). So, because I’m a woman, and because I’ve had some pretty bad experiences in the past when these situations arise, I’m going to try and help you guys out. Please heed my advice and take it seriously, it will help you from avoiding all sorts of awkward scenarios. If you want to order her a drink, don’t make her feel rushed. Wait until she’s at least halfway done with her current beverage. Trust me on this. 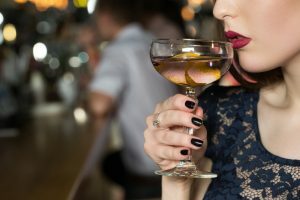 Many women are slow drinkers. Many women are fast drinkers. I can guarantee that you don’t know which kind of woman you’re dealing with. So, wait until she’s halfway done with her drink, and then send her another. Not everyone likes to double fist alcoholic beverages buddy. Plus, if you send them a drink when they already have a full one, you’ll look like you’re just trying to get her drunk. This is not a good first impression at all. Always re-order the drink she’s already drinking. If you’d like to order something else for her, go with a lower ABV, never go with a higher one. If you order the same drink that she’s drinking, chances are she’ll think more of you considering you’re paying attention to her. Or, she’ll think you took the time to inquire about her drink, which also means you’re paying close attention. However, there is always a reason to not order her what she’s drinking, and that reason is if she’s drinking hard liquor by itself. In other words, if she’s sipping on a Jack Daniels neat, I’d go with a lower ABV and order a mixed drink with Jack Daniels in it. If you do this, you won’t look pushy. Also, if she’s not a drinker, don’t send her an alcoholic beverage. Instead, send something non-alcoholic. Even if it’s a soda, she’ll most likely appreciate it. Have the bartender deliver it. Do not deliver it personally. When women turn 21, the first lesson that they are taught to abide by is to never leave their drinks unattended. Another lesson that corresponds to that lesson is to never accept drinks from strangers. That means that if a man comes over to you with an alcoholic beverage, he may have quite possibly spiked that drink with drugs. I know, I may sound crazy, but it’s the truth. There are some jerks out there that would do that. So, in turn, us women won’t accept a drink if you personally come over and deliver it to us. On the other hand, if you have the bartender give us the drink, or if you order the drink through the bartender in front of us after introducing yourself, we will accept the drink. This is the safe route. Try your best to read the situation. When I say read the situation, I mean read if she’s on a date or not. In other words, if she is on a date with someone already, sending her a drink will send the wrong message. I know this should go without saying, but some people won’t take this into consideration (even still some people won’t pay enough attention to the situation to know whether or not the woman is even on a date). In addition to this, read the situation in terms of the woman’s ‘awareness.’ In other words, if she’s already drunk, do not buy her another drink. She’s not an option any longer, as she will be unaware of the interaction between the two of you if she is drunk. However, if you do want to make a subtle move, and she looks as if she’s aware (not drunk), or if she looks as if she’s bored with her current situation, you can pick your beer bottle/glass up and do a sort of long-distance toast. This isn’t creepy. And from there, she can decide if she wants to make her way over to you at some point in the night. Think of the drink as a gift; Don’t think of it as a transaction that she has to pay back. Many women don’t like accepting drinks because they feel as if they owe you something afterward. Don’t make her feel this way, make her feel as if it’s a gift that she doesn’t have to pay back. With that being said, don’t buy her a $30 martini just because you think she’ll want to go over and thank you; If a girl doesn’t want the drink, or doesn’t want to talk to you because you ordered her a drink, she won’t. Point blank. Don’t waste a ton of money. Just keep in mind that they don’t owe you anything if you buy them a drink. This will help you in the long run. Introduce yourself…If she looks open to it. If the drink has been delivered, and she nods or smiles your way, chances are she’s open to the next step: Introductions. Go over to her and nonchalantly introduce yourself. Please, for the love of God, avoid cliché compliments like, “beautiful eyes,” or, “great smile.” Go the authentic route and see what’s different about her. For example, if she’s wearing a sports hat, comment on how you like a certain player from the team and then throw your name in there. Once you’ve introduced yourself, walk away. I mean, you can initiate minor small talk, but that’s it. I’d say get out of the conversation after about 2 minutes, even if everything is going smoothly. In addition, don’t initiate any physical contact. You’ve already sent them a drink and made them aware of your attraction to them, you don’t need to do anything else. You can tell them where you’re sitting or give them your number and then get out. Leave the ball in their court, they’ll feel more comfortable that way.